Congress on Friday night ratified the proposed P3.757 trillion national budget for 2019. The House of Representatives, in plenary session presided by Deputy Speaker and Negros Occidental Rep. Mercedes Alvarez, unanimously ratified the bicameral conference committee report on this year’s national budget -- a few hours after senators and congressmen agreed on the conflicting provisions of the money measure. About an hour later, the Senate likewise ratified the budget, voting 15-5. Senator Panfilo Lacson delivered an hour-long speech slamming the alleged pork barrel insertions in the 2019 budget, while Minority Leader Franklin Drilon said these insertions do not involve funds under his province of Iloilo, while also thumbing down the bicam report. The final version contain some P95 billion realignments for specific agencies, including the Department of Public Works and Highways (DPWH) and the Department of Health (DOH). The two agencies got the biggest allocations at P46.35 billion and P17.57 billion, respectively, based on a summary of amendments sent out by the office of Camarines Sur Rep. Rolando Andaya, Jr., chairman of the House committee on appropriations. Aside from the two agencies, the bicameral conference committee also made the following realignments: Senate, P1.77-billion; Office of the Vice President, P215-million; Office of the The House of Representatives, in plenary session presided by Deputy Speaker and Negros Occidental Rep. Mercedes Alvarez, unanimously ratified the bicameral conference committee report on this year’s national budget -- a few hours after senators and congressmen agreed on the conflicting provisions of the money measure. Aside from the two agencies, the bicameral conference committee also made the following realignments: Senate, P1.77-billion; Office of the Vice President, P215-million; Office of the Ombudsman, P1.8 billion; Department of Agriculture, P485.5 million; Department of Education, P2.5 billion; and state universities and colleges, P2.81 billion. In total, the Senate proposed some P25.4 billion in adjustments while the House introduced P20.65 billion in realignments or a total of P46.35 billion under the DPWH where legislators can identify specific projects. 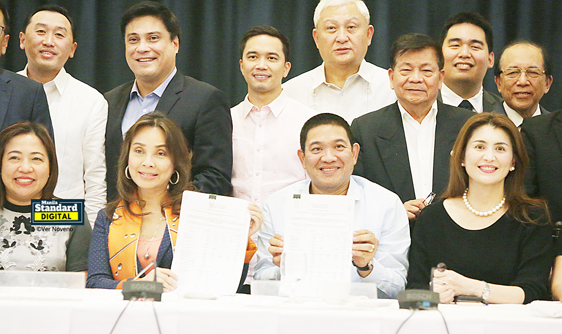 Andaya confirmed that each congressman will get P160 million in itemized projects. The bicameral committee also adopted the P800 million proposal from the Senate’s “institutional amendments” intended for the celebration of World Teachers’ Day this October. Similarly, senators and congressmen carried Andaya’s request the Department of Budget and Management to release some P2.3 billion in internal revenue allotments -- which according to Andaya would not come from the 2019 GAA but from Diokno’s department. Andaya said the 2019 budget is totally pork-free as he earlier disclosed the P50 billion in “institutional amendments” made by Senator Panfilo Lacson. Andaya earlier proposed the abandonment of the one year cash-based budgeting system as proposed in the National Expenditure Program (NEP). Andaya earlier said the Commission on Audit (COA) pointed out in its official statement that cash-based budgeting will cause more problems and will effect a ballooning of accounts payable. The House approved the budget bill on third and final reading last November. The House ratified the money measure as it goes on break to make way for the 90-day election campaign period starting Feb. 13 for the May 13 mid-term elections. The approved budget will be sent to Malacanang for signing by President Rodrigo Duterte. Following strong objections from Lacson, Senate Minority Leader Franklin M. Drilon also voted no to the 2019 General Appropriations Act. “Let the people know. We all claim and boldly announce to all and sundry that all of our amendments are institutional and that we do not have pork insertions. Then let us put our money where the mouth is,” he said in a privilege speech. Drilon likened the budget’s passage, without giving Congress sufficient time to scrutinize it, to signing a blank check. “To give my vote to this budget is like signing a blank check. I simply cannot do that,” he said. “I deny and take exception to that allegation. I would like to make of record that the province referred to is not my province of Iloilo,” he said. In her opening speech, Senator Loren Legarda, Senate finance committee chairman, described the proposed 2019 budget as pro-poor, pro-development, and pro-Filipino.